One of my favourite spots in Chicago is the Bryn Mawr area in Edgewater between Sheridan Road to the East and Broadway Street to the West. 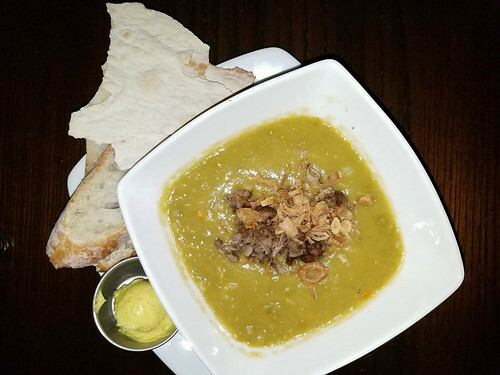 With ongoing growth in the area, it would seem that some new restaurant, coffeehouse, or boutique has sprung up and such was the case with a restaurant called Herb at 5424 N. Broadway Street. Since I was going abroad for personal holiday, I wanted to squeeze in a dining experience so that I would be reminded that I live in one of the most spectacular cities in the world, albeit ruined by overgeneralization and convenient stereotypes. Having read a few reviews, I was curious as to how there would be any kind of twist done to Thai food. 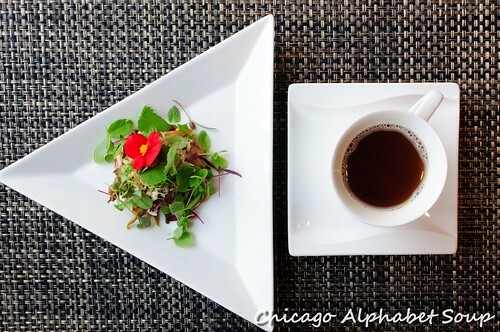 There is a restaurant in Chicago’s Albany Park neighbourhood called Arun that supposedly added a fine dining component to Thai food. 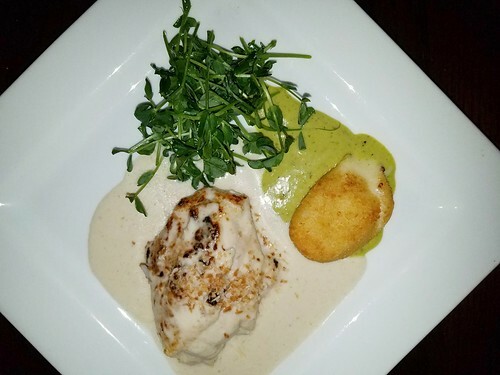 Most of the time you find that making food chic is nothing more than a gimmick. As I discovered at Herb, it just means the chef is damn good at his or her craft. Minus the aesthetics of the interior, I had what I will call my first Thai spa ever. 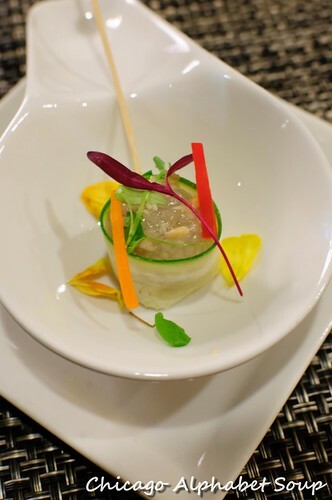 I was in a mood for a full experience and opted for a six-course degustation. 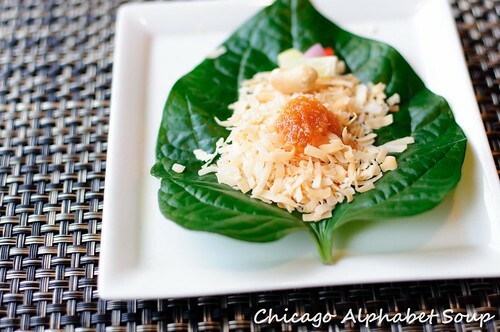 To whet my palate, there was betal leaf with toasted coconut, peanut, some diced fruit, and apricot purée. Served open-faced, you roll the betal leaf up and plop it into your mouth in one bite. 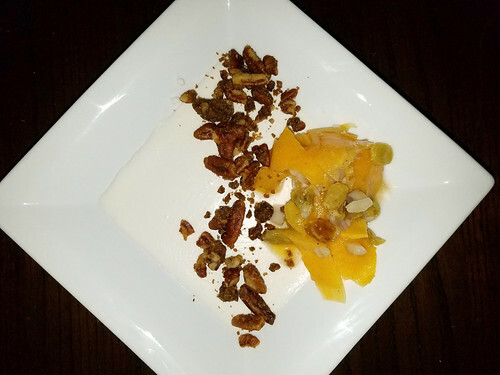 The first thing I noticed was the tartness of some of the diced fruit along with the leaf, later followed by the sweetness of the coconut, and then finished off with a tangy hint from the apricot purée. 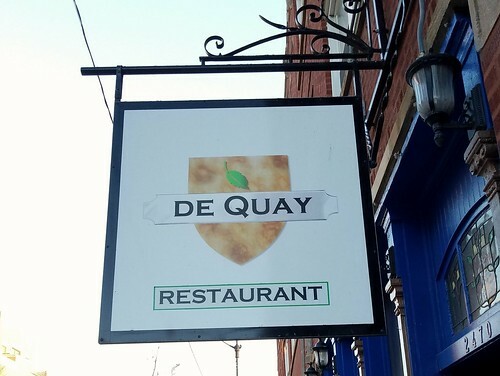 There were no competing flavours all at once on the initial bite, each one taking turns, and I must admit that I have never had that kind of experience before in my culinary jaunts. Leading into the appetizers, I started with moo yang. 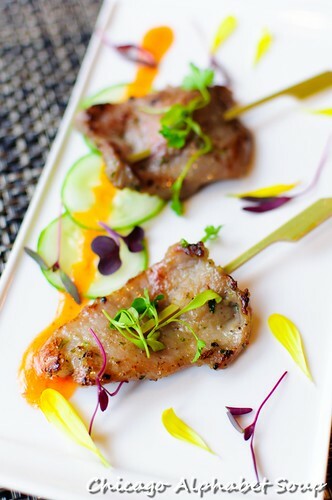 This was a dish of grilled pork that was served yakitori style on skewers. Visually, it looked like dishes you see in food magazines. Food magazines can never begin to capture how well coriander root, lettuce, roasted banana pepper, and spicy tomato sauce work on the meat. 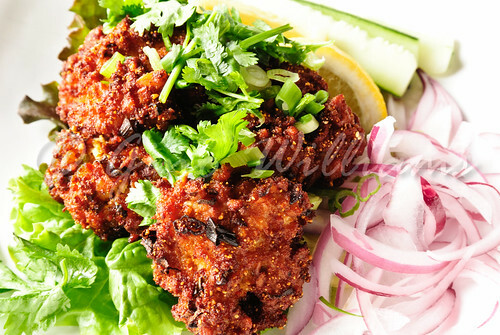 Each bite starts with a spicy kick and ends with a mild sweet finish from having been soaked in coconut milk. By the time I had the neau yang, I noticed a theme of alternating flavours playing on the palate. 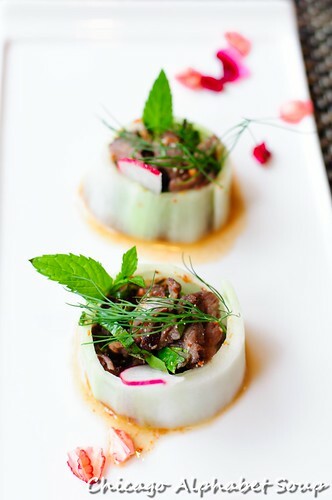 With this appetizer of grilled beef highlighted with shallot, cucumber, coriander leaf, carrot, mint, red chili, toasted rice with chili lime dressing, there is a rising action of tanginess followed by a climax of sweetness and then a denouement of spiciness with a finale of wow — if wow can be described as a flavour. One may think that having flavour come and go while other flavors alternate in a single bite could become old hat quickly. I could become a vegan cold turkey eating the yum tour-pu salad. This salad came as sawtooth coriander, grape tomato, yard long bean, fried shallot, kaffir lime leaf. There was go-between of faint tartness and spiciness. Again, for the flavours to have been complex, the profile of the salad had been prepared such that you experience multiple sensations on your tongue without ever feeling like there was a bit too much to the dish. It was nothing short of Willy Wonka greets Asian dining. 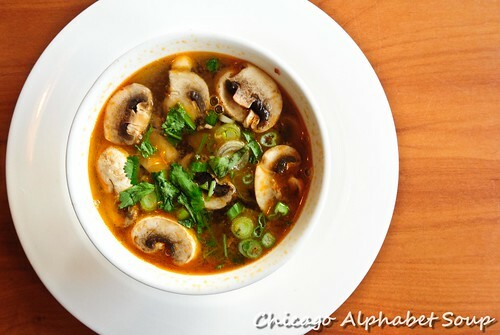 On to the soup, the tom hed ka-min was akin to tom ka gai but prepared with mushrooms instead of with chicken. 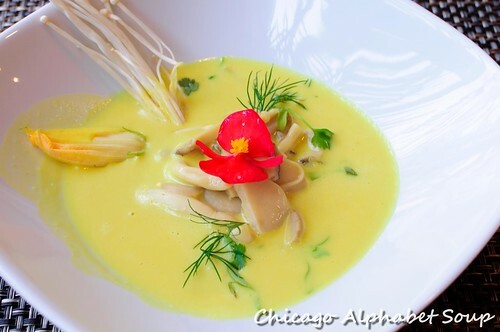 This bowl came as enoki, shimeji, king oyster mushroom, heart of palm, herbal coconut broth, and highlighted with a desire to get patrons addicted. As the server poured the broth, I thought the soup was stunning visually. It was after the first slurp that I realized even photography could do no justice to the richness of the dish. Not only did the broth taste like coconut, and I don’t mean coconut soup from a can, and the mushrooms were indeed fresh, but this was not a small portion. Coming from the restaurant’s summer menu, I could indulge this all year round. Before moving to the main course, there was some time to allow the stomach to get accustomed to so much damn good food and to entertain a few palate cleansers. 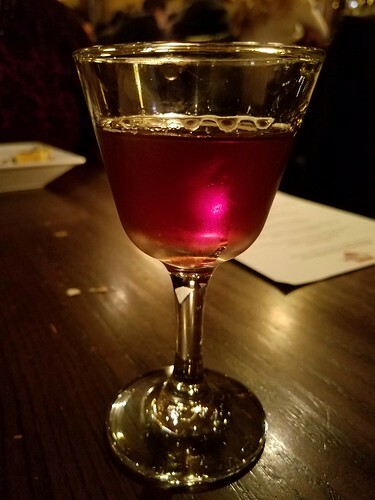 The first was a medley of fruit. 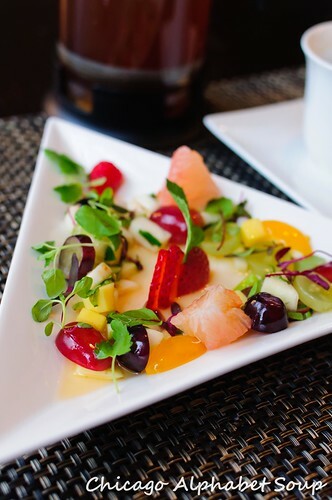 Although it was called a fruit salad because it consisted of strawberries, red grapes, purple grapes, white grapes, passionfruit, tomatoes, and grapefruit, this was another dish that could have me become a vegan convert. The surprise came when I discovered three different profiles: sweetness, spiciness, and tartness. The fruit provided a natural sweetness, shredded chilis gave a spicy kick, and the vinaigrette had a mild salt base. Later there was another l’amuse of a jelly with peanuts and mint wrapped in a thin layer of cucumber. Yet again, there was sweetness followed by a passing tartness. 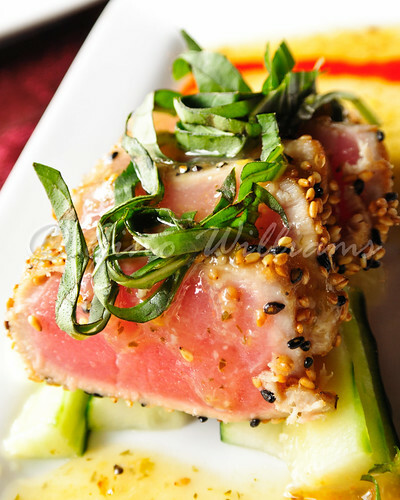 Clearly the chef has perfected generating sensations and waking up your taste buds linearly. The first main course was gang gai tai. I love my Thai curry to be thick. Herb did not disappoint. 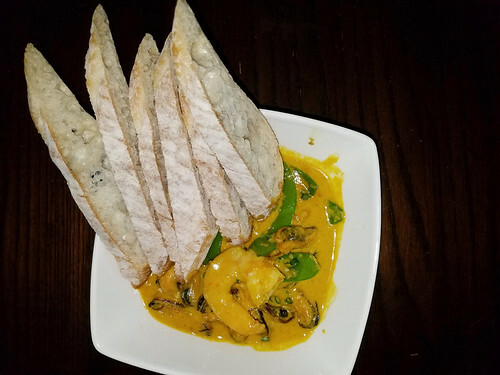 A recipe consisting of Southern-style coconut curry, fuzzy melon, butternut squash, Thai eggplant, red bell pepper, kaffir leaf, and sweet basil, and served with jasmine rice, I was amazed at how light it was. The dish that I thought looked bland was anything but bland. 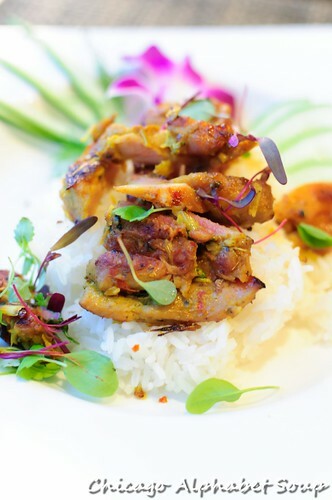 The herbal chicken over jasmine rice made very good use of coriander and lemongrass marinated with spicy-sweet chili garlic sauce. Being curious about why the ingredients were so profound in the dishes, I inquired of the chef who responded that they grow the herbs and spices in the garden behind the restaurant. I think it also explained why there was an absence of salt and MSG in the dishes. The discriminating palate knows. For the finale, there was a flight of fruit. 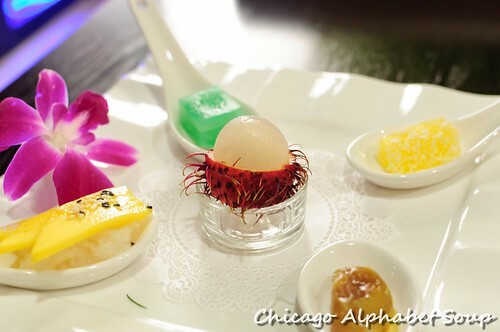 There was rambutan that reminded me of lychee. There was mango over sticky rice, which is a staple dessert in Thai dining. 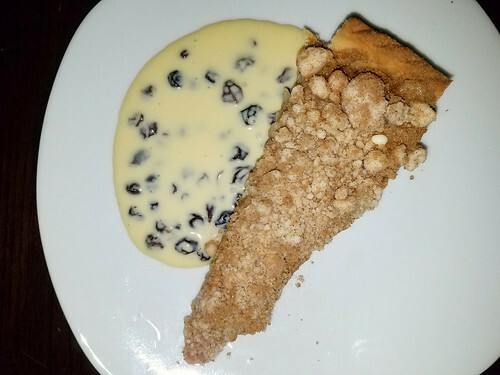 Because I only asked for a flight of light dessert, there were two that I did not get a name for and since I have not developed enough familiarity with my new cellphone, I did not get the voice recorder started so that I could have the chef give the names. 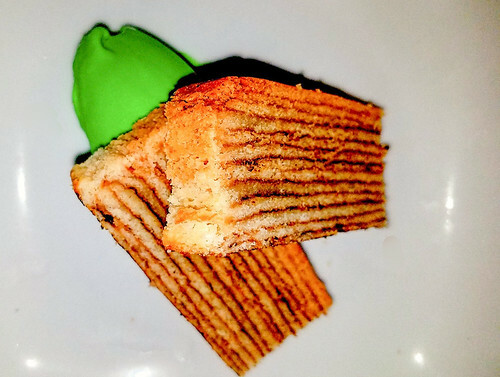 However, one was like gelatin coated in coconut and the other was a gelatinous cake, both bite size and both a new, tasty experience. The final dessert was taro root that put me in mind of tamarind. All light, all natural, all a perfect ending to what was the best Thai dining experience I have had to date. 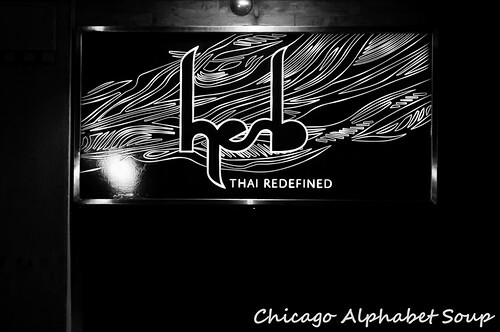 Herb is not a restaurant where you go simply for a sampling of Thai dishes prepared differently than what you expect at commonplace Thai restaurants. Here is where you go for a culinary spa. Well, that is what I would call it. There is no rush, no pressure, and no disappointment. You pamper your appetite, indulge yourself, and relax thereafter because any good meal here is guaranteed to induce food comatose. 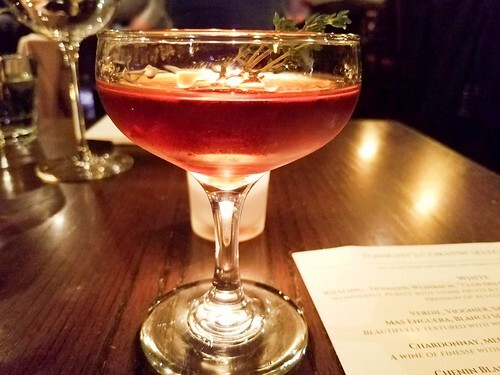 I can say with certainty that Herb will make my top 10 list for 2015 because of such fantastic service in addition to some fine dining that does not come as a hefty price. I treated myself well to a Thai spa. I highly recommend you try it also. With the temperatures in Chicago now feeling consistently tropical, I had started getting more into a Caribbean frame of mind. 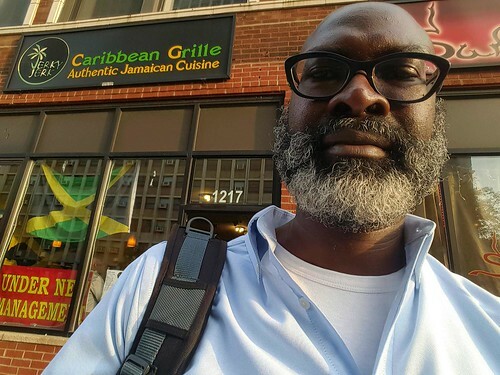 Recognizing that there are a few Caribbean restaurants in the Chicago metropolitan area, most of them I have gone to already, I was on the hunt for a different spot. A great friend had mentioned Jerky Jerk in Chicago’s Rogers Park at 1217 W. Devon Avenue. 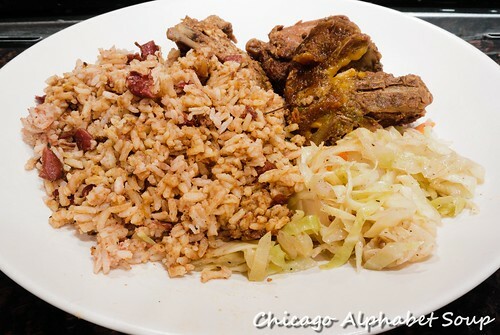 There are traditional dishes that I always get whenever I go to Jamaican restaurants. Beef patties are one of them. 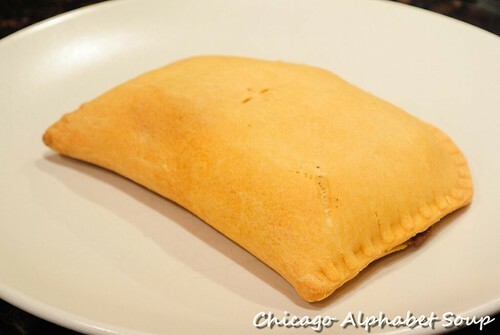 Unlike some beef patties that I’ve gotten at a few other Jamaican restaurants, the ones at Jerky Jerk were stuffed with meat. 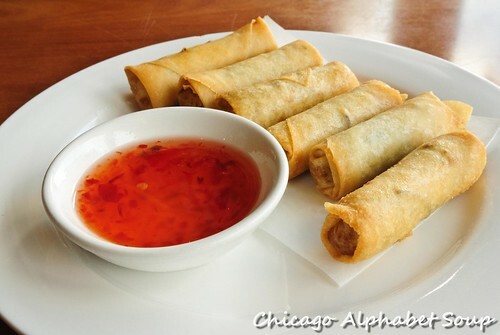 There were no air pockets in these, and with them being spicy, I ordered five more for take-away. I hadn’t had curry chicken in months and I had an appetite for some in a major way. 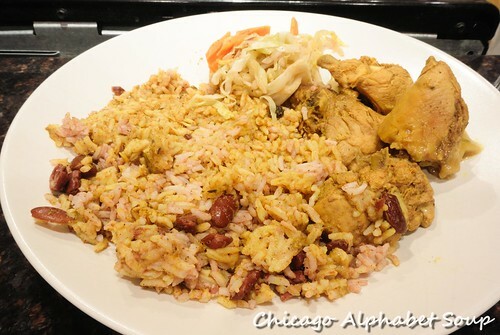 Spicy and loaded with Caribbean taste, the plate of tender chicken with rice and peas and cabbage really made my day. And because I had been in the gym, I was not full even after the plate of curry chicken. So, I had some Mrs. Brown chicken stew with more rice and peas and more cabbage. I can’t say exactly what spices were in the recipe other than what seemed like a marriage of curry and jerk seasoning. What I can say is that I was more than happy to order more of the curry chicken and Mrs. Brown stew chicken for taking home with me. Jerky Jerk is more like a walk-up. There are only a few tables in the dining area and chances are there are several other Jamaicans in the dining room having a go of it in Patois. The atmosphere is very much like what you experience when you are in Jamaica. 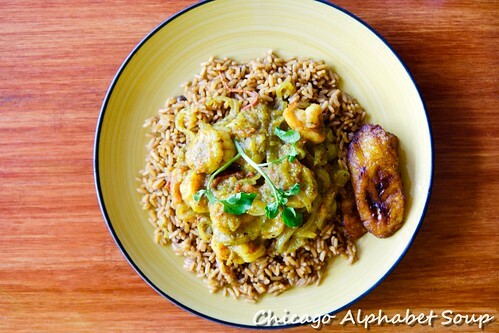 And the food is definitely prepared full of flavour the way it is on that wonderful Caribbean island. I think my paternal grandparents would have been pleased. In previous posts, I have mentioned how Hyde Park has been undergoing changes. And these are welcomed changes. I have gone to a few of the new establishments on 53rd Street. However, there are a few pockets in Hyde Park that bear surprises. Pho 55 at 1611 E. 55th Street is one of those surprises. 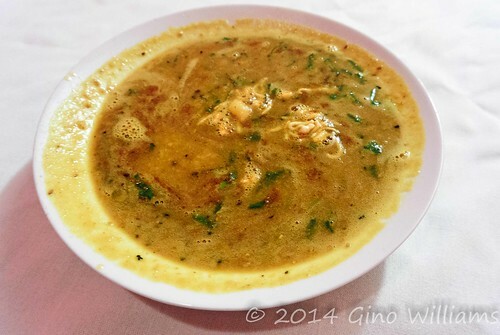 What was once a Middle Eastern restaurant for years is now a Vietnamese restaurant with some delicious menu items for those who are open to sampling dishes from Vietnam. Coming in from humid temperatures, I was in the mood for something refreshing. 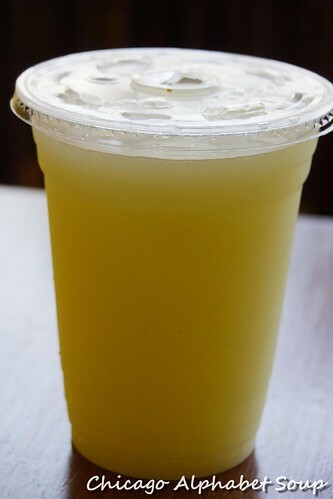 I asked for a recommendation from the server and she told me that the lemongrass and lime drink would be a good option. I accepted the recommendation. I was glad that I accepted the recommendation. 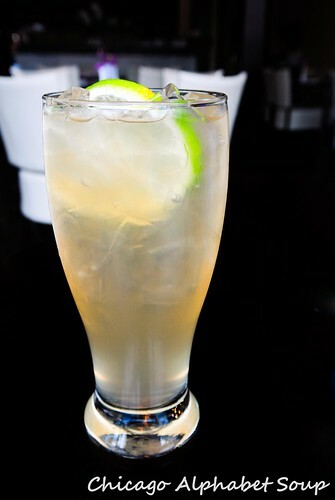 It was akin to a marriage of lemonade, limeade, and a hint of club soda. 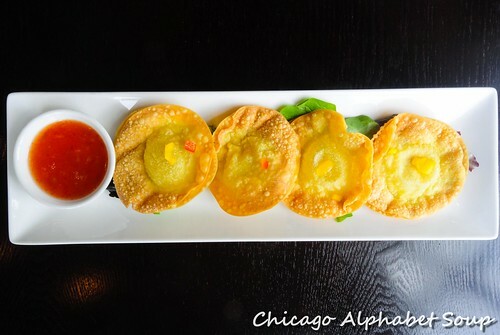 For a starter, I had deep-fried wonton sheets. The thin, minced shrimp inside of the fried wontons were not substantial, but the flavour overcompensated. 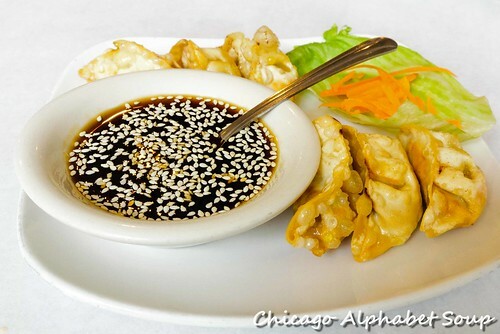 Served with a sweet and sour sauce and atop a green salad, I could have devoured an entrée sized platter of these fried wontons. Having left a graduation ceremony, I had a white shirt on with my suit. Because of that, I did not have a soup for fear that the broth would splash about my shirt. Instead, I ordered grilled chicken in green curry with rice and a salad. I love spicy food and the green curry was spicy enough for a bite yet mild enough that I could enjoy the taste of the dish. Rice at Vietnamese restaurants alway has a perfect texture and the same was the case at Pho 55. As to the salad, I could have cut up the chicken, put it all in a bowl and had a wonderful time working my chopsticks on the dish. I was glad I ordered the curry dish than a pho. I did get one speck of curry on my shirt, though. Being conscious again of my sugar intake, I had fried banana with vanilla cream sauce. 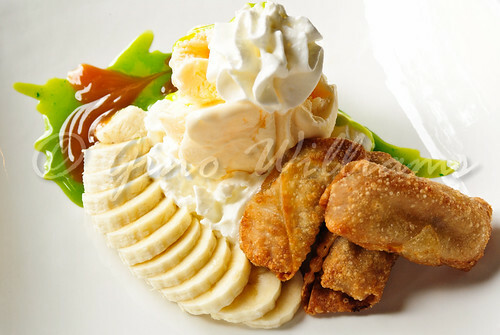 The natural sweetness of the bananas in the fried wontons was better than any sugary dessert that I could have ordered. The vanilla cream sauce was only an accent, more like melted vanilla ice cream of the homemade variety. 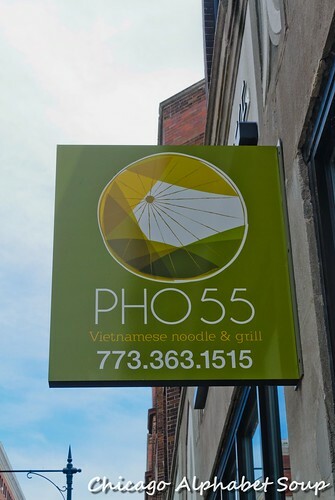 Pho 55 does not have that hustling and bustling feeling that one experiences at Vietnamese restaurants in Chicago’s Little Vietnam along Argyle Avenue. There is a slight upscale atmosphere per the interior decor, but without upscale attitude. The service is fantastic. When you let a server make recommendations and he or she doesn’t act put upon, you have a winner in customer service. With outstanding food from the kitchen, it’s all about one pho the money, two pho the show, three to get ready, and pho to go. Yes, I know that sounds corny, but I couldn’t help it. 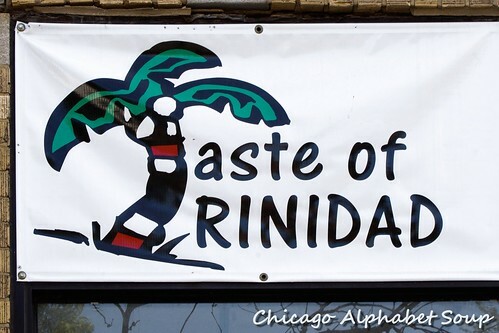 During my days of living in Hyde Park, I became rather acquainted with three Thai restaurants on the E. 55th Street stretch between Lake Park and Hyde Park Blvd. There were Thai Snail, Thai 55th, and Siam Thai Cuisine. Thai Snail was where I learned a few phrases in Thai. Thai 55th was where I practiced speaking Thai. 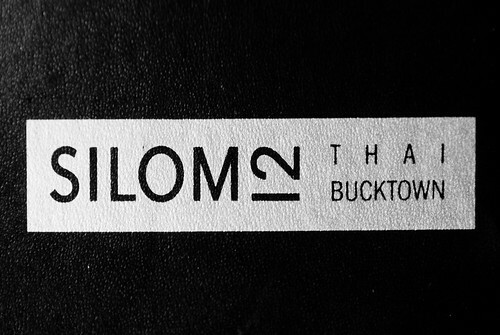 Siam Thai Cuisine was where I became more conversational. Having been gone from Hyde Park for seven years, I found myself in the area checking out the new edition to 53rd Street. 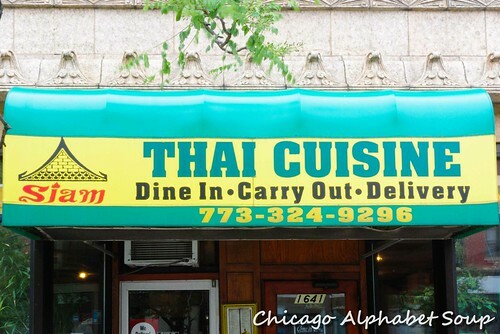 But for lunch, I went to Siam Thai Cuisine at 1641 E. 55th Street. The manager still remembered me, not that I changed that much, except for a full, grey beard. 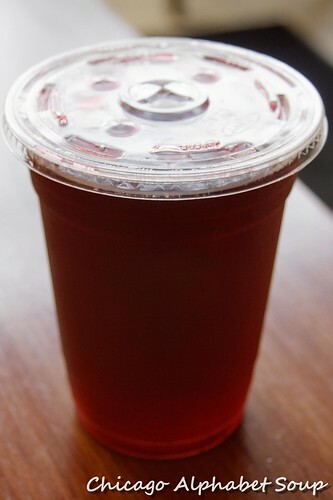 After greetings and pleasantries in Thai, the manager said that I should order “my usual.” I was not going to argue with him about that. 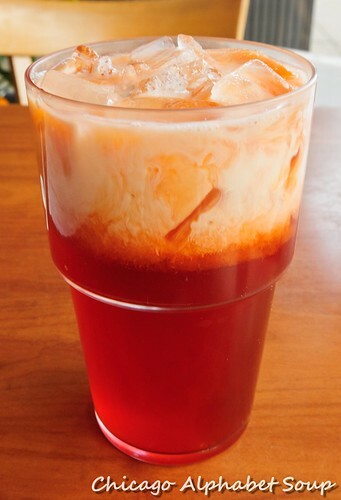 I had a glass of Thai iced tea, which is my favourite kind of iced tea. 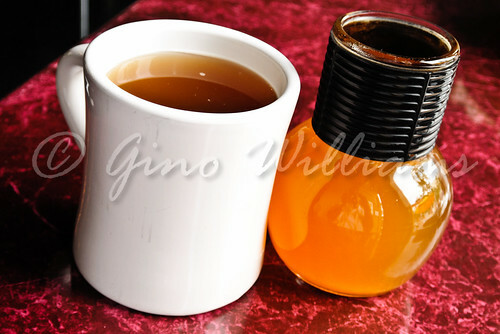 There is something about the smokiness in the tea that beats any pitcher of sun tea brewed below the Mason-Dixon Line. 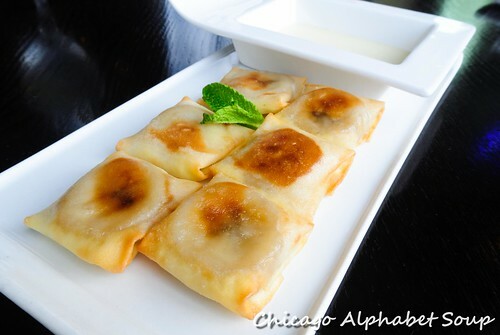 And when there is a plate of potstickers served with it, even the chilly temperatures that we have been having were tolerable. Soy sauce accented with sesame seeds came with the potstickers that were lightly fried, so the texture was not al dente like boiled dumplings. These were my favourite appetizer. Having made a conscious and disciplined decision to remove beef and pork from my diet, I was certain that I was going to have panang chicken come to the table. Ah, but I forgot. 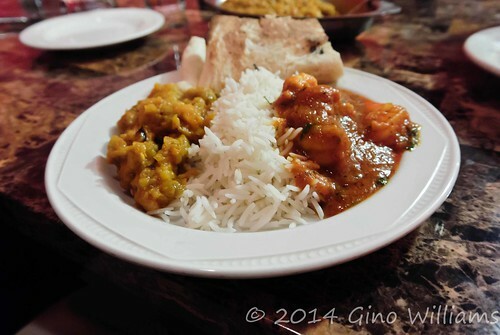 My favourite entrée was yellow curry shrimp. Hearty like a gravy instead of a thin base, this is still my favourite. Filled with plump shrimp, red bell peppers, green bell peppers, and cubes of potatoes, and served with jasmine rice, I was rather glad that the manager remembered how much I loved the dish years ago. Siam Thai Cuisine still has a bit of a hole in the wall charm to it. The manager was an absolute great individual, very much the same outstanding person, just with more grey hair now. 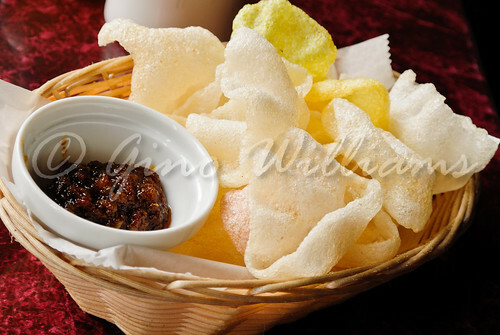 I went to Siam Thai Cuisine at least once a week during my Hyde Park days, either for dining in or for take-away. After this most recent visit and the temperatures warming up soon, consistently — I hope — I may have to bring myself to be okay taking the bus ride from Logan Square to Hyde Park weekly. When your Thai food is “that” aroy, you’ll understand. After a Saturday morning of doing some “dreamed up” CrossFit exercises, I had an appetite unlike I have had since I started CrossFit training in September. I finished off some pancake mix that a friend had given me along with a plate of eggs scrambled with sautéed onions and cilantro. I washed it all down with three glasses of protein shakes and my belly was still growling. There was waffling between going for Indian food or Italian for lunch. I settled on Indian as opposed to Italian and while on my way to my favourite Indian cafe, I walked by a Thai restaurant that looked to have a cozy cafe feel to it. Well, having never been there, I stopped in. Ben’s Noodles and Rice at 1139 W. Bryn Mawn Avenue was my destination. I was not in a mood for pondering what I wanted. Truth be told, I glanced at the menu for some appetizer that I hadn’t had before. The basil rolls with spicy plum sauce caught my eye. It was meant to be because the fine, ground beef wrapped in basil leaves, wrapped more in finger-length pastries, and then deep-fried was a highlight. 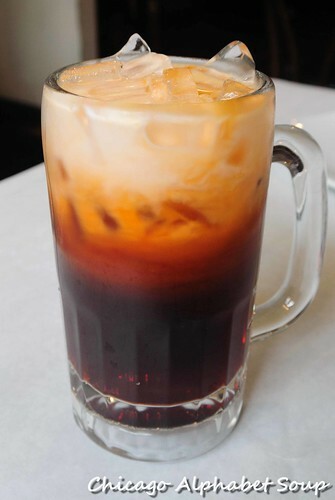 A bigger highlight was the Thai iced tea, which wasn’t merely red tea with milk in it. 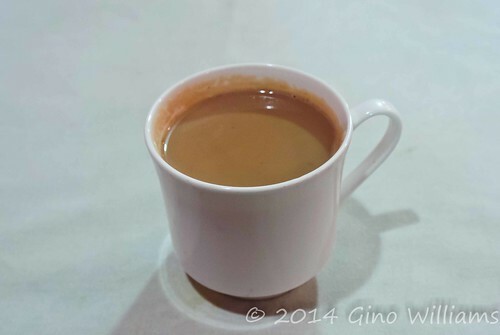 This tea had a smoky flavour to it that heightened my addiction for the beverage. It may not be to the liking of everyone’s palate, but I was satisfied with its balance to the basil rolls. The temperatures in Chicago had been quite nippy, and being only a few blocks from the lake doesn’t make matters better, I wanted something spicy. I ordered tom yum goong and requested it to be Thai spicy. 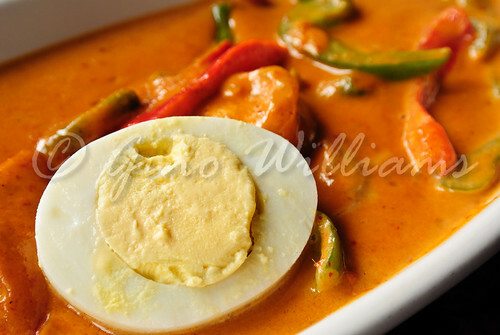 Warning: If you are not accustomed to eating spicy food, do not order your dishes Thai spicy. Instead, order them mild. I loved the peppery bite in each sip and final slurp of the tom yum goong. Plump shrimp, fresh mushrooms, cilantro, chives, and flavourful broth made for a perfect recipe in a bowl to make the wintry chill not so bad. 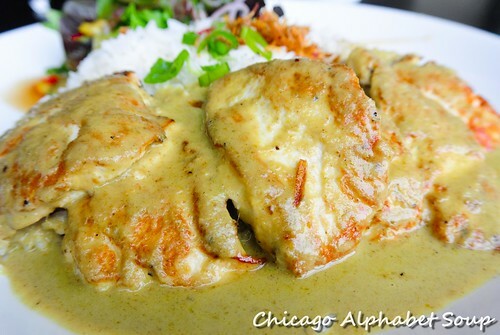 To thoroughly sate my appetite, I ordered panang curry chicken. It has been rather hard for me to deviate from Thai curries, being a culinary zombie for any curries. 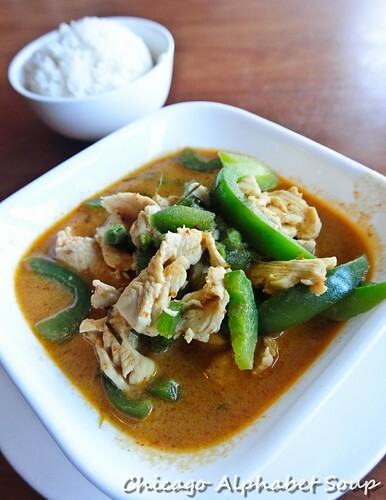 The panang curry was of a thin consistency, but packed with green peas, bell peppers, chicken, and a wow factor. 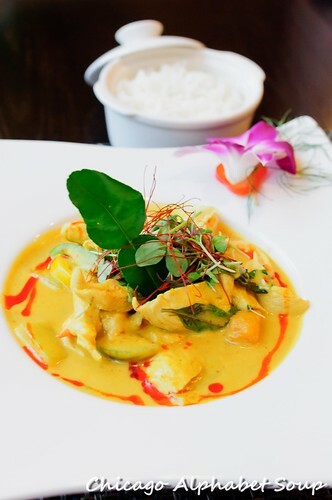 Having had green curry, red curry, yellow curry, panang, and mussaman at countless Thai restaurants, I highly recommend to anyone that they opt for curries when they order. 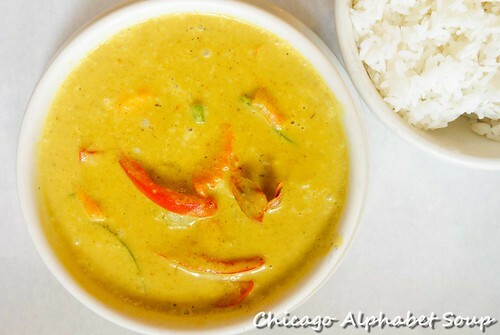 Definitely order the panang curry at Ben’s Noodles & Rice. And for my finale, I had the fried banana and a cup of green tea. 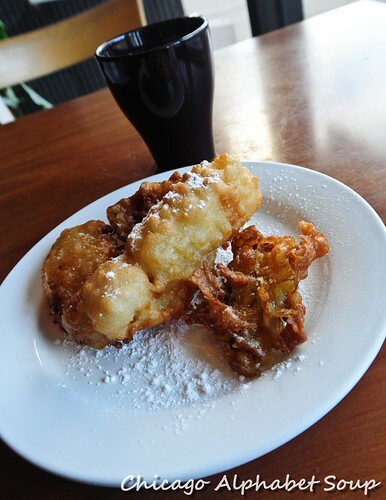 Bananas dipped in coconut milk, deep-fried, and dusted with confectioners sugar are the best. They’re golden. They’re delicious. They make me smile. They are the best, indeed. 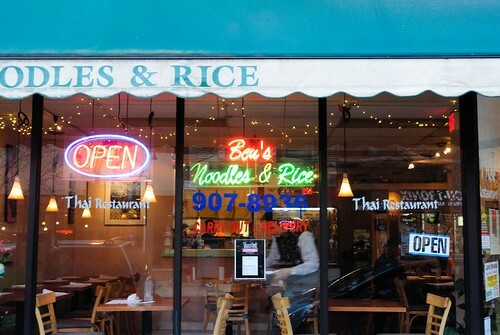 Ben’s Noodles & Rice is definitely one to go to for an authentic Thai dining experience. 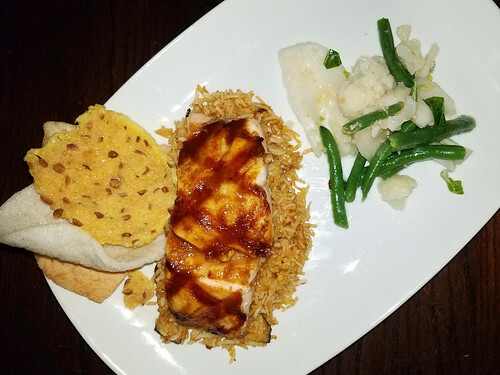 There was a constant flow of individuals coming in to enjoy a meal at the restaurant and a steady stream of customers coming in to order something for to-go. Noticing a lot of customers and the restaurant staff greeting each other by name and very familiarly, it was evident that Ben’s Noodles & Rice is common grounds for those who appreciate not only the outstanding food, but the top service. When I think back on the possibility of me having had Indian or Italian food for lunch this particular day, I am glad that I settled on Thai. Yes, I will be one of those customers who return to Ben’s Noodles & Rice so often that they will probably make recommendations for me in advance of me reaching for a menu. 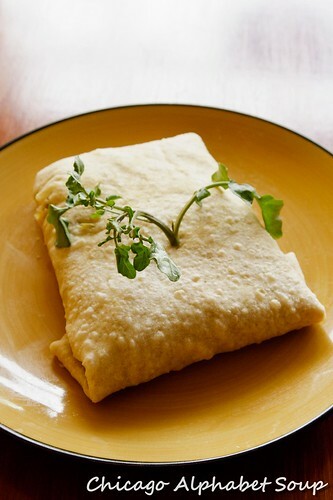 One would think that for a man who loves to eat a lot, he would cook his own food most of the time. I use the eyes on my stove to boil water for my tea and the conventional oven to heat food. But to actually pull together some ingredients, concoct a dish, and then cook is something I haven’t done in quite some time. So, I either pick up food to-go on the way home from work or I order delivery from GrubHub. One of my most recent GrubHub orders came from an Indian restaurant that was out of my delivery range, which meant I had to drive to the location to get the food. Well, it was so blooming delicious that I decided to go in for a proper sit-down to blog. Paprika, at 2547 W. Lawrence Avenue, sits in a small strip of stores. It’s a quaint restaurant with a seating area that looks like the repurposed family room in a house. And that whole look and feel create an atmosphere of being at someone’s home, even before the owner welcomes you and tells you to make yourself at home. 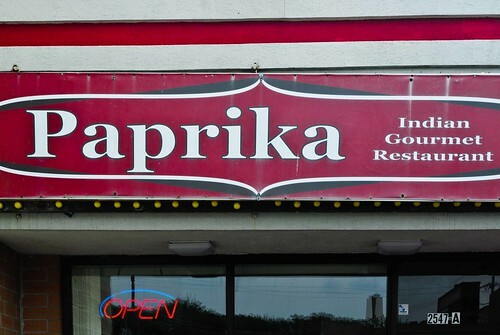 Having been in business for fifteen years in the Devon Avenue stretch, Paprika moved to Lawrence Avenue a few years ago in the Albany Park neighbourhood that abuts Lincoln Square. 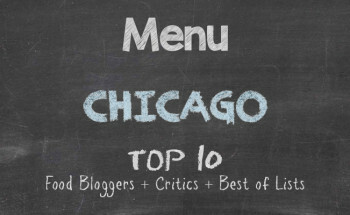 At this new location is where they are providing great service and lip-smacking fare. As usual, I had a ravenous appetite. 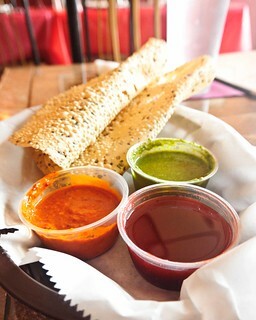 There were complimentary papadam and three sauces — tamarind chutney, cilantro chutney, and a spicy paprika sauce — that came to the table. 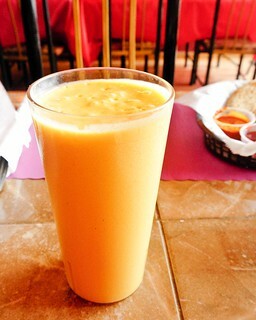 Knowing that I was going to have my dishes spicy, I ordered a mango lassi, which was refreshingly outstanding. For a starter, I ordered vegetable samosas. Mild in flavouring, that was fine since I knew that the entrées I had planned to sample would compensate for the tempered spices in the samosas. I couldn’t quite place if the samosas were baked or if they were lightly deep-fried. 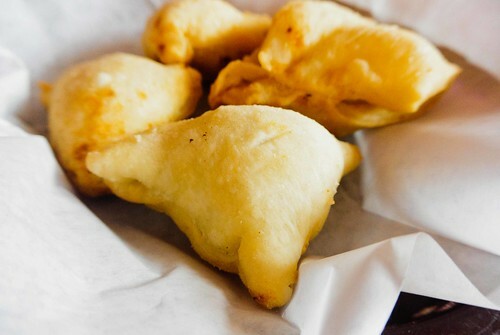 Slightly crispy, they had the texture of French beignets — that being crispy on the outside and chewy on the inside. I mashed them up, added the sauces, and gobbled them. There was no buffet, so ordering was indeed off the menu. There were two entrées that I wanted to sample. 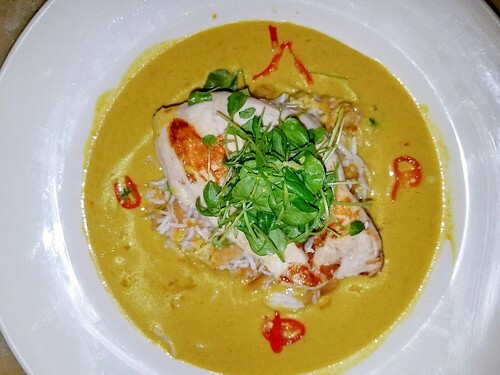 After waffling between whether to order the butter chicken or the coconut curry chicken, I accepted the owner’s recommendation and ordered the latter. I was expecting the base to be of coconut milk. However, it was curry gravy with shaved coconut. I immediately fell in love with the dish after the first swallow. 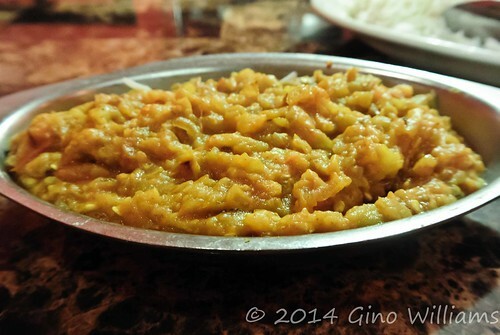 Unexpected is good when it comes to Indian food. 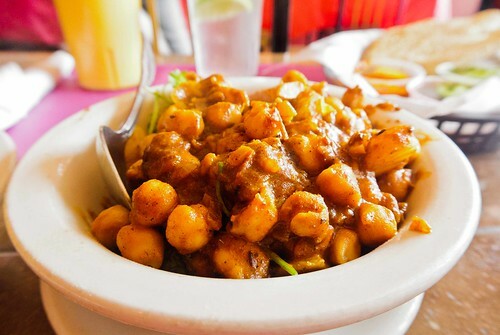 The second entrée was chana aloo. Served with naan, I should have ordered bhatura or poori instead of the naan. Because I had requested to have the chana aloo spicy, I got it the way I love it. I could taste the cumin and cloves. 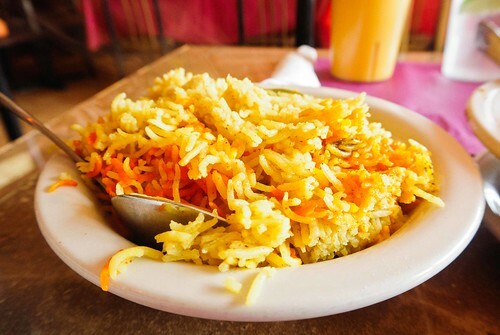 The basmati rice that came with both main dishes also brimmed with a hint of saffron and cloves. Scooped with the chana aloo and scooped with the coconut curry chicken, I was thoroughly pleased that I had made Paprika my lunch spot. Well, with a meal consisting of a satisfying appetizer and two entrées well worth writing about, I sat and talked to the owner at length. We chatted about the plethora of Indian restaurants in London, the authenticity of traditional meals in Toronto, and how street food in the alleys of Delhi, Mumbai, Bangalore, and Calcutta is hands down the best. And somehow conversation segued into what we thought was some of the best dessert to be found. That was when I had some kheer placed in front of me. 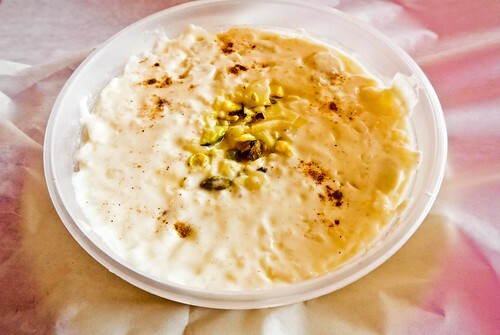 When people say, “It’s the best [fill in the blank with choice dessert] ever,” there is a tendency to hide giving side eyes and saying to yourself, “Yeah, right.” The kheer at Paprika was so incredible that I would have body slammed a rugby player if he were to have messed with my kheer. Anyone can mix rice, milk, sugar, saffron, cinnamon, raisins, pistachio, and almonds. Not everyone can “get it right” the way Paprika does. 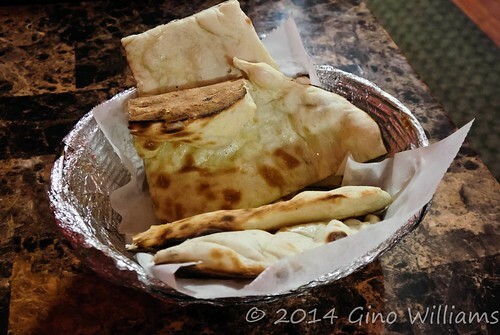 What many in Chicago are starting to recognize is that like Middle Eastern food, Indian food is gaining a larger presence. Much of that is because of the great taste in the food and the other factor is, well, it simply taste so blooming fantastic. 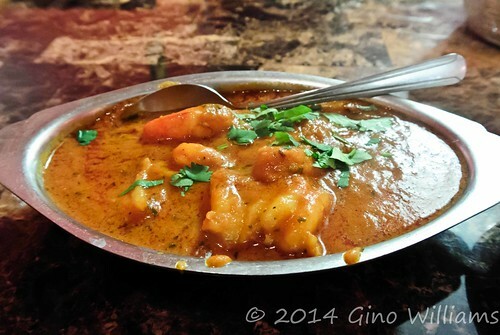 Because of the popularity of Indian dining, there are more restaurants opening their doors in locations away from Devon Avenue. Not that there weren’t choices from which to pick on Devon, but now there are locations opening quite possibly very close to you. If you love Indian fare and going to restaurants where you are made to feel at home, Paprika is definitely one eatery to add to your list. 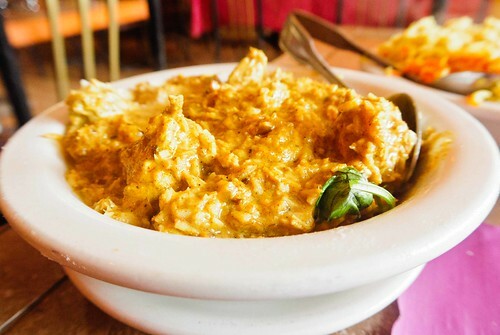 When the owners greets you with, “Swatgatum,” simply respond with, “Shurkria,” take your seat and prepare to ka some mind-blowing Indian goodness.